To have Jose Mourinho on your bedside table for advice seems a novel way of resolving a problem that keeps you awake at night during the World Cup. The tournament is going well for Argentina but Diego Maradona [ ] said he might give new Real Madrid  manager Mourinho a ring if he felt the need to discuss a tactical issue. 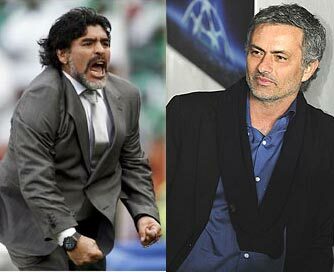 "I like Mourinho a lot (as a coach)," Maradona said of the Portuguese coach who guided Inter Milan to a treble last season. "On top of that, the way he received me, we spent hours talking about football, attacking and defensive tactics," he said in an interview with Thursday's Argentine daily La Nacion. "He seemed to me a guy to take to your bedside table and ask him each time you need something. "I've got his phone number, I might call him," Maradona told Daniel Arcucci, the reporter who co-wrote his autobiography "Yo, el Diego" (I, Diego). Maradona, however, said he would not go as far as using the ultra defensive tactics Mourinho's Inter employed to get past Barcelona in this year's Champions League [ ] semi-finals. "No, not that. But it worked for him, right? He won the Champions League," he added referring to their triumph over Bayern Munich [ ] at Madrid's Bernabeu [ ] stadium. Argentina face a World Cup second round clash with Mexico at Soccer City outside Johannesburg on Sunday after winning their three group games scoring seven goals and conceding one. Although Maradona's key player Lionel Messi [ ], 23 on Thursday, has yet to find the net, he has had 20 shots at goal so far, the most of any player at the tournament, and twice hit the post while laying on chances for team mates. No player has come within 30 percent of Messi's form at the finals, Maradona said. "I don't know if tomorrow people will say I'm arrogant but none was 30 percent of Tevez either, because Carlitos thrills you playing... I love my team." Asked if Messi's tournament would compare with Maradona's 1982 finals in Spain, when he fell short of expectations, or if he was ready to emulate his performance in Argentina's 1986 victory in Mexico, he said: "I think he's there. "I believe he's broken the mould and is ready, let's end the comparisons. Leo is ready to go out onto a pitch and leave it (the tournament) with the crown."